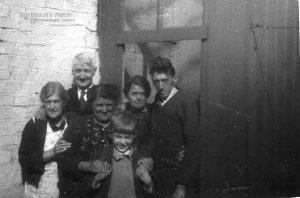 10.6.1914: Launched by Smith’s Dock Co Ltd, South Bank-on-Tees, Middlesbrough (Yd.No.583) for The “Wyre” Steam Trawling Co Ltd, Fleetwood as BROCK. 1.8.1914: Registered at Fleetwood (FD47). 8.1914: Completed (Magnus B. J. Wedum, manager). 11.1914: Requisitioned for war service as an armed trawler (1-6pdr) (Ad.No.927). Fitting out at Devonport. 2.12.1914: Sailed for Queenstown, Co. Cork (Ch Sk. John Sandham RNR). Fitted out as an A/S trawler. 7.5.1915: Passenger liner LUSITANIA (30,396grt/1907) on passage New York – Liverpool with 1,959 passengers. At about 2.00 pm. when about 15 miles S of Old Head of Kinsale torpedoed by U.boat (U20); sank in 18 minutes in position 51.24N 08.31W. Left Queenstown and arrived on scene just after 3.00 pm. picked up 65 survivors and assisted others in boats. Landed survivors at Queenstown. Total loss of life 1198 persons. 16.5.1916: Off Co. Cork with HMS LAVENDER (P.No.T23); HM Paddle Tug HELLESPONT (P.No.W86); HM Trawlers BLUEBELL II (Ad.No.479) (GW5) and MOROCOCALA (Ad.No.2656) (A238) assisted in salvage of Glasgow steamer KELVINBRAE. (4068grt/1907). 2.1917: Sk. J. W. Tilney RNR appointed (Ch Sk. 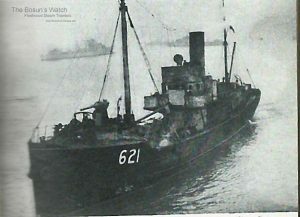 John Sandham to HM Trawler RISTANGO (Ad.No.819) (GY946)). 5.1918: Sailed for Weymouth to join Southern Patrol (Sk. George M. May RNR). 31.8.1939: Requisitioned for war service as a minesweeper (1-6pdr, 2-20mm) (P.No.FY.621) (Hire rate £81.1.4d/month). 25.5.1940: Sailed Dover for Calais in company with the trawlers ARLEY (P.No.FY.620) (FD44), BOTANIC (P.No.FY.707) (FD47), CALVI (GY269), FYLDEA (P.No.666) (FD72), MARETTA (P.No.FY.665) (FD45), POLLY JOHNSON (H322) and drifters PLAYMATES (P.No.FY.738) (YH141) and WILLING BOYS (P.No.FY.947) (LT737) with several river launches in tow. 26.5.1940: At 6.57pm. ‘Operation Dynamo’ (Dunkirk evacuation) put into effect.(Lt. Henry P. Granlund, awarded DSC for good service in HM Minesweeping Trawlers and Drifters). 30.5.1940: At 8.30am. arrived Dover with 6 troops. 1945: Sold to Shire Trawlers Ltd, London (William A. Bennett, manager). 1949: Sold for breaking up. Fleetwood registry closed. 26/05/2017: Removed FMHT watermarks from images. This entry was posted in Steam Trawlers, Steamers (Picture) and tagged Wyre on January 15, 2009 by Fred Smith.